Since winning Stars in Their Eyes in 2000 with a record 864,838 votes, Gary Mullen has toured the world with his breathtaking One Night of Queen. His uncanny vocal resemblance to the late Freddie Mercury has enthralled hundreds of thousands of people throughout theUK, USA, Europe, South Africa and New Zealand. His popularity is still sky high after all of these years. 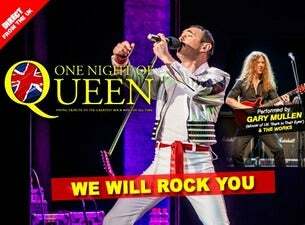 Since winning Stars in Their Eyes in 2000, Gary Mullen has toured the world with his breathtaking One Night of Queen, a spectacular live concert.